Don Draper would not be pleased. 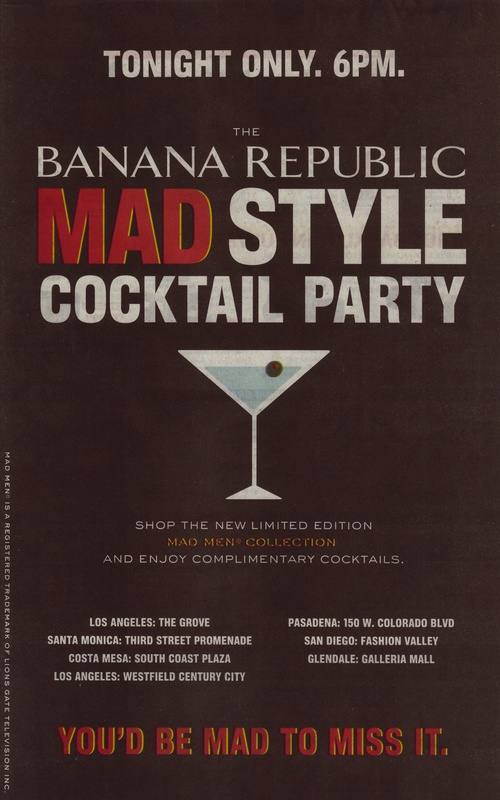 Banana Republic’s newspaper ad for their Mad Men party. This past Thursday, fashion retailer Banana Republic ran an ad announcing a “Mad Style” Cocktail Party. So I decided to check out the event, expecting Mad Men décor, swinging sounds, the BR staff decked out in the outfits with period hairdos, and a tux-clad bartender shaking up ice-cold martinis. Maybe I’d add to my skinny-tie collection while there. I was greeted at the door by two BR employees wearing their usual garb. One held a tray of three drinks, including non-alcoholic apple cider, and the other proffered a plate of roasted potatoes in cream sauce. No, really. Not sure what part of the 1960s inspired roasted potatoes in cream sauce, or why Banana Republic would want people eating roasted potatoes in cream sauce as they wandered aisles of new clothing, but I wasn’t tempted, and neither employee seemed enthused about this new wrinkle in their job requirement. I entered the store, and the interior looked and sounded like Banana Republic as usual: very very quiet. Nothing distinctly 1960s about the place. I walked around seeking a dedicated room or section devoted to Mad Men, but found instead a small island with only a few articles of clothing and copies of the book The Fashion File by Mad Men costume designer Jamie Bryant, who also designed the BR line. That was it. Woohoo, party. As for the clothes themselves, they looked nice, but the collection over-emphasized sweaters. Sweaters? Maybe there are sweaters in the TV series (perhaps on old man Cooper), but I was anticipating slick suits and cool blazers, particularly anything from the wardrobe of character Pete Campbell (Don Draper’s the man, but Campbell sports the snazzier duds). One standard suit looked like something Draper would wear, but the entire display left me feeling uninspired and, oddly, a bit embarrassed. And, apparently, so felt the handful of customers in the store, who didn’t exactly mob the display. Now this was Century City, an intensely-corporate copse of highrises in the middle of L.A.’s Westside, filled to the sky with thousands of lawyers and Hollywood agents. You’d think they’d turn out for the Mad Men collection — or at least a free drink. I guess they didn’t get the memo. Don Draper would be fuming. Now, I’ll cut Banana Republic some slack. I did show up “fashionably late” (7 pm instead of the announced 6 pm). And because the Mad Men line is also “fashionably late” (2011 instead of 2008, when Mad Men-inspired fashions were gracing the pages of Esquire and GQ), perhaps BR didn’t want to overdo it. Maybe they spent all their money on just licensing the brand from Lion’s Gate, so they could only afford roasted potatoes with cream sauce. And maybe the other stores (such as the one near Lion’s Gate HQ) boasted more action. Then again, this is a brand new clothing line supposedly inspired by an ad agency. And this is Banana Republic, which has a lot of money — and even greater needs. Banana Republic has struggled to find a position (i.e., market niche) since they ditched safari wear decades ago for more mainstream attire. The brand is ostensibly for graduates of their sister store, The Gap, who crave more quality and sophistication. But too many BR clothes bear “Made In China” tags, which tend to say the opposite, and the styles look just like what’s hanging in a Macy’s — or even The Gap. The Mad Men line could reposition the entire BR brand as one that’s Hollywood hip yet New York sophisticated, appealing to young professionals who realize there’s more to work wear than jeans and a graphic T. But if a company goes to all that trouble and expense to license and launch a new line based on a TV series, it needs to go all the way. Or, as Eating The Big Fish author Adam Morgan would say, it needs to over commit. BR needed to blow the the cocktail party up into a movie premiere style event, with the show’s cast making in-store cameos (at least here in L.A.). BR needed to crank the music, bring out the cocktail shakers, and put the entire store and crew into character. Sure, all that would cost money, but so does surviving in a highly crowded and competitive fashion marketplace. Done right, it might have even generated some press coverage. Instead, the Mad Men effort felt halfhearted, less Madison Avenue and more midtown mall. And as any true Mad Man could tell you, a diluted cocktail won’t generate much buzz. P.S. I didn’t buy anything in the store, but when I got home and started conducting research for this article, I found a 25% off deal on the BR site. So I scored the Mad Men mac jacket for a discount the same day it was launched. I was happy, but somewhere, Don Draper is shaking his head and pouring another drink. Sounds as if a lot more “buy-in” by the promotional folks at BR needed to be done. A promotional event isn’t just an ad and the associated hyperbole, it has to have that special feel, and, as you noted, it was lacking, (the presence of roasted potatoes in cream sauce duly noted.) Even the mixed message of a “Casting Call” for a walk-on dilutes the effort unless there’s at least plan to get those best-dressed ladies and men to ‘audition’ throughout the hour-long event. Do they show up and buy the outfit, or arrive dressed and, therefore, obviously are not in need of the outfit? Perhaps the coup de gras in this promotional ‘FAIL” is a review of much of the lead-in press. It’s more devoted to talk of the designer, and not the connection to the potential myriad of era outfits and their characters, a foreshadow to the lack of outfits, and the lack of follow-on media coverage. Although my BR didn’t have a party that I know of, I totally agree with you as to what the event should have been. In my opinion, however, the women’s collection is very safe and uninspired and doesn’t really evoke the era. I was excited to see the clothes because I thought they would be very flattering to me but they’re not anything special. I attended the mad men launch in San Francisco. I was super excited and dressed for the occasion: a houndstooth cable car dress, shoes, bag, and hair to fit. They DIDNT HAVE THEIR LIQUOR LICENCE. All their signs read “Free Cocktails”. The poor bartender had to break the news to everyone expecting such. I tipped him just the same, as I was sure he was in for a rough night. I looked around just the same, and one of the salesmen was hideously rude and snobby. He ended up insulting me and laughing about it with one of his co-workers. I was so surprised, I didn’t speak to anyone about it, which normal Sarah would absolutely do. I left and didn’t look back. I didn’t even look at the dress I was eying. Sorry Banana, at least one of your salesmen and your event planner need to “shut the door, have a seat”, and not in a good way. Wow, what a disappointing way to fail your customers, BR! I was curious about the collection, since it’s coming out way behind the schedule (unless it’s waiting for a revival of the style from when everyone else was doing it a couple years back). The long term BR shopper in me still rooted for them. Thanks for the timely and entertaining reporting of this campaign. All of the above — great dissection and commentary, BTW — duly noted. Funny you should mention it, but my girlfriend and I strolled past the BR last night in The Grove (also in LA for those who don’t know it) but, alas, past closing time. They DO have a striking GET MAD window design — but here, too, we thought a strong tie-in with the series was lacking…and, in one man’s and woman’s opinion, the fashions didn’t seem to link in that closely with stuff in the series. Guess it’s that sweater thing again. (Joan’s dress was nice, my girlfriend said — but on a personal level, we both thought they missed a bet by not using a mannequin with Joan’s “Barbie-esque” dimensions; if anywhere, Southern Cal is the place to find zillions of women who’ve had “work” done to get to that, um, outstanding size. Another bet missed.). Well, maybe their head of store promotios or whoever can “do a Don,” open his own shop and do it up right the second time around. We didn’t have the benefit of seeing how they dressed the inside of the store (yet), but based on all the commentary above, I’m not expecting to be overwhelmed. Freddy’s Response: Nice post, Jesus! You raised a lot of great details, such as the release dates of the DVD and the new season. But you should be neither mad nor flattered. I hadn’t seen your post, nor even heard of you, until now. Thanks Freddy – I guess their execution continued to worsen – they lost me at the poorly planned launch. I hope you share my point of view that success is not guaranteed by following the latest hype but by adhering to sound marketing principles. Freddy: Absolutely. BTW, here’s another article that discusses Banana Republic’s inept execution of the Mad Men line.